It is a short entry this week as I am trying to spend as much time in the field as possible. This week has seen a couple of warm sunny days of 14 ̊C, but the last 2 days have been wet and windy, with almost constant rainfall meaning that water levels in the streams have risen substantially. Fieldwork has been going well however, and I have been able to collect and sort macroinvertebrate samples from 3 of the 5 streams we are studying for foodwebs. Alongside the work I mentioned last week, we are also studying nutrient uptake. This involves adding small amounts of ammonium, nitrate, phosphate and ammonium combined with acetate to the streams to look at uptake rates. Simon and I have managed to do a couple of nutrient uptake experiments in the past week, and we now have to wait for the water levels to go down again after almost 48 hours of rain! We still have 5 days left to finish off everything we need to before we fly home. That will mean some long days in the field. Luckily, here at Zackenberg there is always a brilliant chef throughout the summer months, so it’s great to come back to the station after a long hard day to a nice warm meal. I will upload some photos of our work and the area when I’m back in the UK next week. My first week at Zackenberg has flown by. There is no internet access from Zackenberg, only email via satellite. So Hannele Savela from INTERACT WP4 will be uploading these entries for me whilst I’m here. Zackenberg is a research station in northeast Greenland. To get here, you have to take a twin-otter airplane from Akureyri, north Iceland. We had a nice surprise when we landed at Reykjavik as it was FlyBE’s first flight from Birmingham to Reykjavik. We were greeted at the airport with Champagne, chocolate coated strawberries and a cake decorated with icebergs! On the flight to Zackenberg, when the sky is clear it is an incredible journey, with views of fjords and sea ice along Greenland’s coast. A great start to the field season! I am at Zackenberg for 3 weeks collecting data for my PhD. It is a stream hydroecology project, studying the cascading influences of different water sources on stream physico-chemical habitat, and how this in turn affects stream biodiversity. 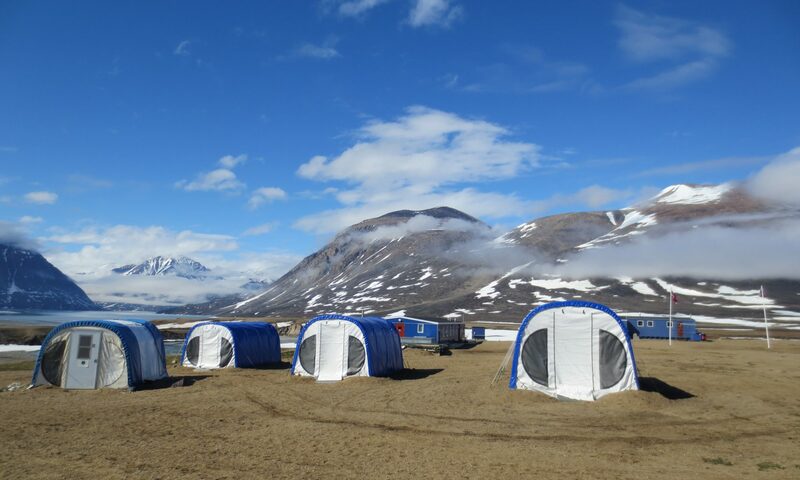 We are also collaborating with Tenna Riis and Simon Leth from the University of Aarhus, Denmark, who are also collecting data here at Zackenberg this year. One of my supervisors, Alexander Milner, and Tenna have been here for the past week to help set everything up, but left yesterday. Now Simon and I have two weeks remaining to collect all the necessary data. This is my second visit to Zackenberg and everything looks completely different to the last time I was here. In 2013, there was very little snow fall, meaning the streams were running low on water. This year the winter snowfall was higher than average. The water level of the streams is much higher and there are streams this year that were dry the year before. Giving us much more to work with! We have successfully installed 3 gauging stations on different streams in the area. So we will be recording turbidity, conductivity, water level and water column and stream bed temperature throughout the summer season- Luckily Lars, who works on the permanent biology team here has agreed to take them out in September for us, giving us much more data to work with. We’ve also been busy collecting samples of aquatic macroinvertebrates, of which we expect Chironomids, non-biting midges, to be the most abundant. We’ve also installed pitfall traps close to the streams to see if terrestrial invertebrates form a link in stream food webs. So far we have had many flies and spiders falling in, and also one caterpillar. It has been a very busy week but there is still a lot more to be done, so I must get on with field work! I will write again next week.